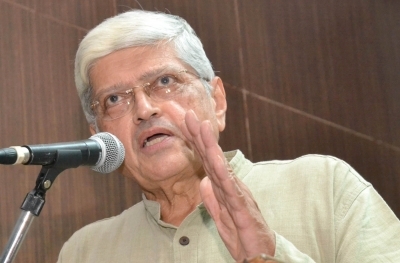 New Delhi, Feb 5 (IANS): Contrasting the grandly-funded Statue of Unity and the simple craft of envelope-making that Sardar Vallabhbhai Patel undertook during a jail term during British rule to save money, former West Bengal Governor Gopal Krishna Gandhi recalled the Mahatma's Gujarati phrase "Vallabhbhai ni kala" to praise his co-prisoner's skill. Speaking at the opening panel of international symposium ‘Creativity And Freedom', which was inaugurated at the India International Centre (IIC) on Tuesday, Gandhi cited the vast body of Indian prison literature, especially the widely-read books written by the Mahatma, Jawaharlal Nehru and Bhagat Singh when behind the bars. During a jail term from 1932-33, Patel, on the other hand, busied himself with "not a phenomenally intellectual activity, but a craft activity" -- making 'lifafas' (envelopes) -- and focused diligently over the task using the material he had "thriftily and creatively", the former civil servant said. He recalled the politically, philosophically, and historically priceless letters his grandfather, Mahatma Gandhi, had sent to Devdas (the fourth and youngest son of the Mahatma) during the prison term. Many of the letters, preserved by Devdas, were sent in envelopes prepared by Vallabhbhai Patel. In a letter dated May 11, 1932, the Mahatma had mentioned that the envelope containing the letter had been made by Patel. "We thus save money pai by pai," he had written. In another letter, Gandhi tells his son to observe the envelope for "Vallabhbhai ni kala" (Vallabhbhai's artistry), and in yet another, lauded his determination and said they "may well set up a fair-sized shop for envelopes" when they were free from jail. But where did the paper for these envelopes come from? "It was not bought. Remember they were saving 'pai by pai'. They were made from incoming letters," Gopal Gandhi said. "One size of an incoming letter is blank, if one so wishes, that can be turned into an envelope. But not all letters with one page blank are turned into envelopes, only those, the contents of which, if read by another, will pose no problem. That is the uniqueness of this shop. Patel looked for incoming letters with an intentness in cat's mind for a mouse," he quoted from his grandfather's writings. "What the simple envelopes tell is that, the man for whom a 182-metre -- the world's tallest and perhaps, the costliest -- statue has been built, made the smallest of the objects using one side of paper to save 'pai by pai'," Gandhi said. The two-day symposium also opened with theatrist-filmmaker Suman Mukhopadhyay's personal account of encountering a world of censorship in performing arts, author Kunal Basu's emphasis on orthodoxy hindering creativity, and business journalist T. N. Ninan's speaking on how creative ideas move business, stocks and the market. The panel also featured Victoria And Albert Museum chairman Nicholas Coleridge, who spoke on museums and creativity, and Ashoka University vice-chancellor Pratap Bhanu Mehta, who deliberated upon modern societies accepting arts' freedom by keeping them marginal. The symposium relooks at creativity and freedom as two integral posts of society, which are being "reimagined and redefined", through the lens of thinkers, academics, filmmakers, artists and others from the creative world, who will present how they view freedom and creativity and their models for the future, Symposium director, art historian and curator Alka Pande told IANS.